I first saw There Was A Crooked Man as a part of TCM’s tribute to the great actor Warren Oates. Warren Oates was rarely cast in the lead but, as a character actor, he appeared in supporting roles in several great films. Unfortunately, There Was A Crooked Man is not one of them. 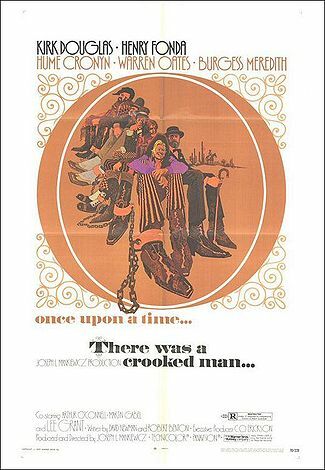 Directed by Joseph L. Mankiewicz and written by the screenwriting team of Robert Benton and David Newman (best known for writing Bonnie and Clyde), There Was A Crooked Man is meant to be a comedic western. Outlaw Paris Pittman (Kirk Douglas) is arrested while visiting a bordello. Paris is sent to an Arizona prison, where everyone tries to get him to reveal where he has hidden the stash from a $500,000 robbery. Pittman uses everyone’s greed to manipulate them into helping him attempt to escape. Standing in Pittman’s way is the new warden, a liberal reformer played by Henry Fonda. There Was A Crooked Man is a long movie that features a lot of familiar faces. Burgess Meredith plays The Missouri Kid, who has been in prison for so long that he is now an old man. Hume Cronyn and John Randolph play a bickering gay couple who eventually become a part of Pittman’s scheme to escape. Even Alan Hale, the skipper from Gilligan’s Island, shows up as a guard named Tobaccy! There Was A Crooked Man is a big movie but it’s also not a very good one. It’s not serious enough to be a good drama but it’s not funny enough to be a good comedy either. At least the movie has Warren Oates going for it. Oates plays Harry Moon, a prisoner who is drafted into Pittman’s escape plot. It is a typical Warren Oates supporting role but he steals every scene that he appears in. Even in the smallest of roles, Warren Oates was worth watching and he’s the best thing about There Was A Crooked Man. While watching the 1963 best picture nominee, Cleopatra, I had many thoughts. The film lasts over 4 hours so I had a lot of time to think. For instance, I often found myself impressed by the sheer size of the production. I marveled at the recreation of ancient Greece and Rome. I loved looking at the ornate costumes. I loved feeling as if I was taking a look back at what Rome may have actually looked like at the height of the Roman Empire. Making it all the more impressive was that this film was made in the days before CGI. When the film’s Romans walked through the streets of Rome, they weren’t just actors standing in front of a green screen. They were walking down real streets and surrounded by real buildings. It reminded me of the awe and wonder that I felt when I was in Italy and I was visiting the ruins of ancient Rome. And, as I marveled at the recreation of Rome, I also thought to myself, “How long is this freaking movie?” Because, seriously, Cleopatra is an amazingly long movie. It’s not just the film is over four hours long. It’s that the film feels even longer. Gone With The Wind, The Godfathers Part One and Part Two, Once Upon A Time In America; these are all long films but, because they’re so great, you never find yourself checking the time while watching. Cleopatra is the opposite of that. Cleopatra is a film that, at its slowest, will make you very much aware of how many seconds are in a minute. I found myself marveling at the lack of chemistry between Elizabeth Taylor and Richard Burton. If anything, this is the most shocking thing about Cleopatra. If Cleopatra is famous for anything, it’s famous for being the film where Elizabeth Taylor (cast in the role of Cleopatra) first met Richard Burton (who was playing Mark Antony). Their affair dominated the gossip headlines. (If TMZ and YouTube had been around back then, there would be daily videos of Richard Burton punching out paparazzi.) Cleopatra was the first of many big-budgeted, overproduced films that Taylor and Burton co-starred in. In the role of Mark Antony, Burton spends most of the film looking absolutely miserable. Elizabeth Taylor, meanwhile, seems to be having a lot more fun. It’s almost as if she understood what Cleopatra was going to become so she went out of her way to give the type of over-the-top performance that the film deserved. The same can also be said about Rex Harrison, who plays Julius Caesar and who, perhaps because he appears to have shared her attitude, actually does have some chemistry with Taylor. Actually, if anyone gives a truly great performance in Cleopatra, it’s Roddy McDowall. McDowall plays the future Emperor Augustus with a mesmerizing intensity. Again, McDowall’s performance is not exactly subtle but Cleopatra is not a film that demands subtlety. As the film finally neared its end, I found myself wondering how Joseph L. Mankiewicz went from directing two close to perfect films, A Letter To Three Wives and All About Eve, to directing this. Even more amazing, Mankiewicz had previously directed one of the best Roman Empire films ever, 1953’s Julius Caesar. (When compared to Cleopatra, the low-key and thoughtful Julius Caesar appears to have been filmed on an entirely different planet.) Well, in Mankiewicz’s defense, he was not the original director. He was brought in to replace Rouben Mamoulian, who had previously attempted to make the film with Joan Collins, Ben-Hur‘s Stephen Boyd, and Peter Finch. When Mankiewicz was brought in, the cast was replaced with Taylor, Burton, and Harrison. Between the expensive stars, the troubled production, and all of the offscreen romantic melodrama, Mankiewicz probably did the best that he could. Today, Cleopatra is mostly interesting as an example of a film from the “Only Gigantic Productions Will Save Us From Television!” era of Hollywood filmmaking. Cleopatra started out as a $2,000,000 production and ended up costing $31,000,000. It was the number one film at the 1963 box office and it still nearly bankrupted 20th Century Fox. While the film does have some kitsch appeal, the critics hated it and it’s easy to see why. And yes, it was nominated for best picture of the year, a tribute to the size of the production and the determination of 20th Century Fox to get something — anything — in return for their money. Cleopatra is a bit of a chore to sit through but it can be fun if you’re in a snarky mood. It’ll do until the inevitable Angelina Jolie remake comes along. Judging from the films that the decade produced, the 1970s were truly a paranoid time. (Of course, 2015 is a paranoid time as well, which is probably why so many of the classic films of the 70s still feel incredibly relevant.) Some weekend, you should watch a marathon of 1970s films and I guarantee that, by the time Monday rolls around, you will be looking for lurkers in every shadow and automatically distrusting any and all authority figures. The 1970s were a good time to be paranoid. And it’s really not surprising at all. The previous decade was a time of turmoil and upheavel, a time when some people feared protestors and some people feared the establishment but, ultimately, everyone was afraid of someone. When you think of the 1960s, you think about all the leaders who were violently assassinated — John F. Kennedy, Malcolm X, Martin Luther King, Robert F. Kennedy, and more. (And that’s just in America!) And then the 70s came along, with Watergate and the revelations about the CIA partnering up with the Mafia to try to kill Fidel Castro. The 70s were a good time to be paranoid and the films of the 70s reflected that fact. Take for instance, 1974’s The Parallax View. The Parallax View opens and ends with assassination. In both cases, the victims are U.S. politicians who are running for President and whose ambitions have caused concern for the shadowy and rarely seen leaders of the established order. In both cases, the official story is that the assassin was a lone gunman, a nut with a gun and absolutely no political or religious motivations. Of course, both accused assassins were apparently involved with the shadowy Parallax Corporation and, over the course of the film, anyone who knows anything about Parallax ends up dying. Reporter Joe Frady (Warren Beatty) goes undercover to investigate the group but, as he does so, he grows increasingly paranoid and unstable, until finally it’s easy to mistake him for any other paranoid madman, ranting in the street and, in many ways, indistinguishable from the accused assassins that he’s been investigating. In many ways, Joe becomes like a character in a H.P. Lovecraft short story who, upon laying eyes on Cthulhu, is driven mad as punishment. It’s a good film, one that’s enhanced by Gordon Willis’s trademark shadowy cinematography and the convincing desperation of Warren Beatty’s performance. In the film’s best scene, Frady applies for a job with the Parallax Corporation. As a part of his job interview, he’s taken a dark room and he’s told to watch a short film. His reactions will help to determine what role he could possibly play at Parallax. Needless to say, The Parallax View feels just as relevant today as it did when it was first released. We still live in paranoid times and hints of conspiracy are still everywhere to be seen. Perhaps the only thing that has changed is that, back in 1974, conspiracies could still take people be surprise. Now, we just take them for granted. I can still remember that day like yesterday. I was either 10 or 11 and I was at a big family gathering in Arkansas. I was at my aunt’s house. My great-grand uncle was sitting in a corner of the living room and watching the TV. Because he was nearly blind, only an inch or two separated his face from the screen. And, because he was almost deaf, the television was blaring. When we first arrived, he was watching what sounded to be a cartoon but, after a few minutes, he changed the channel. That blew my young mind. It wasn’t because I necessarily knew that much about Franklin D. Roosevelt, beyond the fact that he had been President. Instead, it shocked me because that was the first time that I had ever heard anyone call a U.S. President a dictator. It was the first time that I truly understoodd that not everyone shared the same opinions, especially when it came to politics and history. Looking back, so many of the things that define me as a person — my skepticism about conventional wisdom, my mistrust of authority, and my tendency to dismiss “experts” — are the result of that day, that documentary on the Great Depression, and my great-grand uncle’s opinion of Franklin D. Roosevelt. And, let’s face it — FDR is a controversial figure. Most of what you read about Roosevelt is positive but if you glance under the surface, you realize that the legacy of the New Deal is far more ambiguous than most people are willing to admit. You realize that there are serious questions about whether Roosevelt knew about the upcoming attack on Pearl Harbor. You discover that Roosevelt wanted to reform the Supreme Court so that it would be a rubber stamp for the executive branch. And, of course, his decision to run for a third term set up exactly the type of precedent that — if not for a constitutional amendment — could have been exploited by the wrong people. And, yet, as ambiguous as his legacy may be, how can you not be inspired by FDR’s personal story? He went from being a dilettante who was often dismissed as being an intellectual lightweight to being four-times elected President of the United States. In between running unsuccessfully for vice president in 1920 and being elected governor of New York in 1928, Roosevelt was crippled by polio. It’s always been a huge part of the Roosevelt legend that his battle with polio transformed him and made him into the President who led the country during the Great Depression and World War II. It’s an inspiring story, regardless of what you may think of Roosevelt’s political ideology or his legacy of government intrusion. It’s also a story that’s told in our 15th entry in Shattered Politics, the 1960 film Sunrise at Campobello. This film opens with FDR (played by Ralph Bellamy) as an athletic and somewhat shallow man who, while on a vacation with his family, is struck down my polio. The film follows he and his wife, Eleanor (Greer Garson), as they learn how to deal with his new physical condition. Throughout the film, Roosevelt remains upbeat and determined while Eleanor remains supportive and eventually — after being out of the public eye for three years — Roosevelt gets a chance to relaunch his political career by giving a nominating speech for Gov. Al Smith at the Democratic National Convention. Sunrise at Campobello is one of those films that tends to show up fairly regularly on TCM. It’s a well-acted film with Ralph Bellamy and Greer Garson really making the aristocratic Roosevelts into sympathetic and relatable characters. At the same time, whenever I’ve watched the film, I’ve always been struck by how long it seems. (The movie itself is only 144 minutes, which means its shorter than the average Christopher Nolan flick but it’s one of those films that seems longer than it actually is.) Sunrise at Campobello was based on a stage play and it’s directed like a stage play as well, with little visual flair and emphasis on dialogue and character. The end result is a film that I can’t really recommend for the casual viewer but one that is, at the very least, interesting for students of history like me.